All trees are special, but for me the red pine, or akamatsu, is very special indeed, and I am very happy that this tree also grows in our Afan woods. 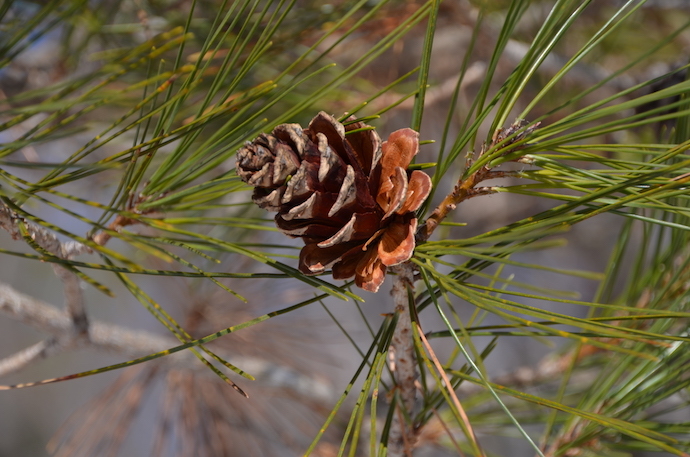 The Latin name for the red pine is ‘Pinus densiflora’ which comers from the abundance of yellowish-red male cones. ‘Dense flowers’. The Japanese name is more obvious because the tree has a lovely reddish-brown bark that can glow so beautifully in a setting sun. The red pine has been spread all over the world, but its origins were in Japan, Korea, northeast China and southeast Russia. Its timber is light, durable, strong and rot resistant, and was very commonly used in building. Red pine timber can still be seen in shrines and temples all over Japan, many several hundreds of years old. Pine timber burns very hot, and is still used to make pottery, and in our region, to forge knives and sickles. One reason why the pines burn so hot is because of its resin, a great fire starter. Pine resin has been traditionally used in votive candles, giving off a wonderful fragrance, and the soot gathered after the burning was used to make ink. To most of us, if we use the word ‘matsu’ we think of pine mushrooms, matsutake, a great favorite in Japan, but one which is on the decline. Nowadays, much of the pine mushrooms eaten in Japan are imported from Korea, British Columbia in Canada, and Oregon and California in the US. Our Japanese pines are under attack from a nematode, accidentally brought in from the USA, a tiny parasitic worm now carried by a long-horned beetle. The nematode is carried into the bark by the boring of the beetle, after which it spreads, destroys the sap, and kills the tree. Some expert have claimed that the spread of this pine-killing disease is really caused by air pollution, especially by acid rain, which both weakens the tree and hinders the production of pine mushrooms. Where you get plenty of pine mushrooms (matsutake) you have healthy soil and healthy trees. I personally also think that the pinewoods need to be carefully tended, as indeed they always were in the past. Pine trees can thrive on poor soil however, and are one of the trees to recolonize land after forest fires. In the west, especially North America, pine timber is popular for furniture use, because of its lightness and strength, although the timber has to be carefully treated for its abundance of resin. I like to gather pinecones for fire starters or kindling. Pine nuts or seeds for human use come from about twenty species of pine with seeds large enough to harvest. 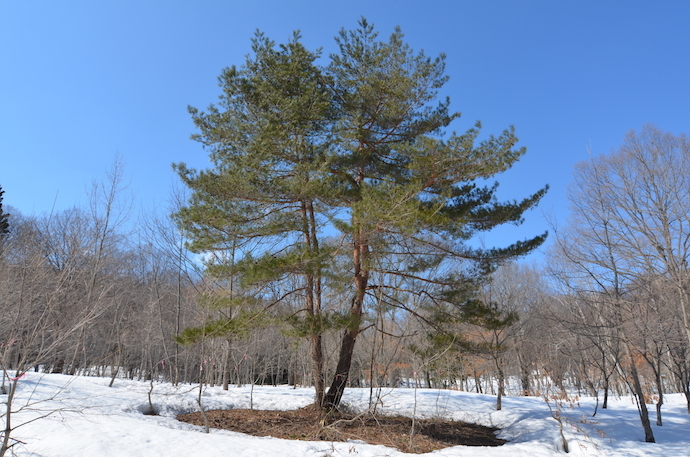 In Asia the most popular come from the Korean pine (Pinus koraiensis) and from the chilgoza pine from the Himalayas. American pine nuts are also imported. In our woods, it is mostly the squirrels that harvest the little red pine seeds. We have yet to fine matsutake in our woods, although we keep on hoping.